The ferry from Battery Park to Staten Island and back is a great way to see the Lower Manhattan skyline and Hudson River life while resting your feet. It's a must-see New York attraction that doesn't cost a thing. The ferry also skirts the Statue of Liberty affording decent views of this iconic structure. Most tourists stay onboard for the return leg, but it's worth hopping off and exploring a bit of Staten Island while you're there. 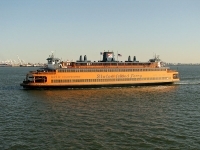 Staten Island is a borough of New York City and a fun neighbourhood to explore, but the ferry journey, mainly used by commuters, is actually the main attraction. The ferry leaves roughly every 30 minutes or every hour and takes 25 minutes each way. Schedules are available on the official website. Opening times: Runs 24 hours, see website for schedule.